Christmas is just around the corner! Are you still struggling with your Christmas decorations? Decorating with lights for Christmas is a tradition. Electric string or fairy lights can add a romantic, festive and warm mood to our space or occasions. You don’t have to just string those lights up on the tree. 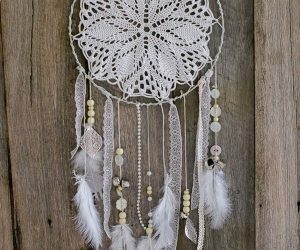 Here we have found a great collection of awesome and unique string and fairy light decoration ideas for Christmas. From the mantle decoration with lights to globe light winter luminaries to lighted Christmas sign, it’s all here. 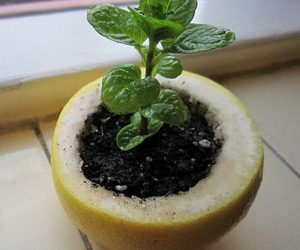 Take a look at these creative ideas and give your favorite one a try this Holiday season! 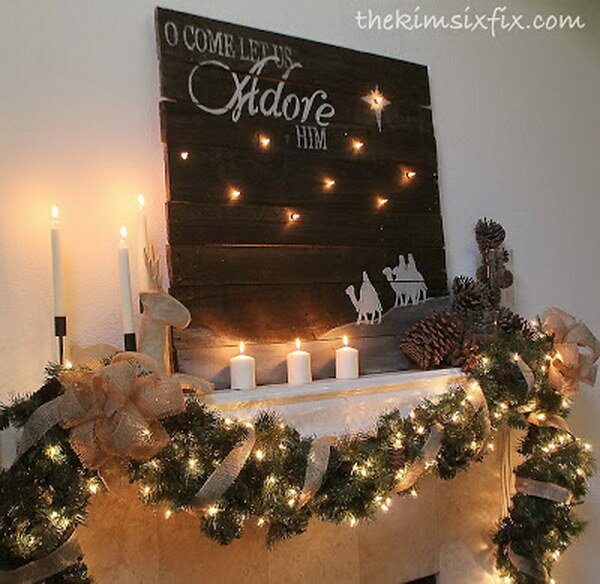 Create a rustic Christmas lighted garland with some burlap together with a string of clear Christmas lights. This is perfect for stairs, mantels, or even the tree decoration! 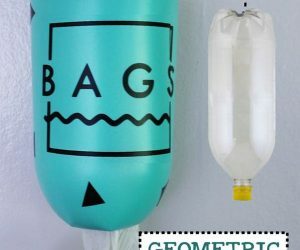 Get the DIY tutorials via Create Craft Love. 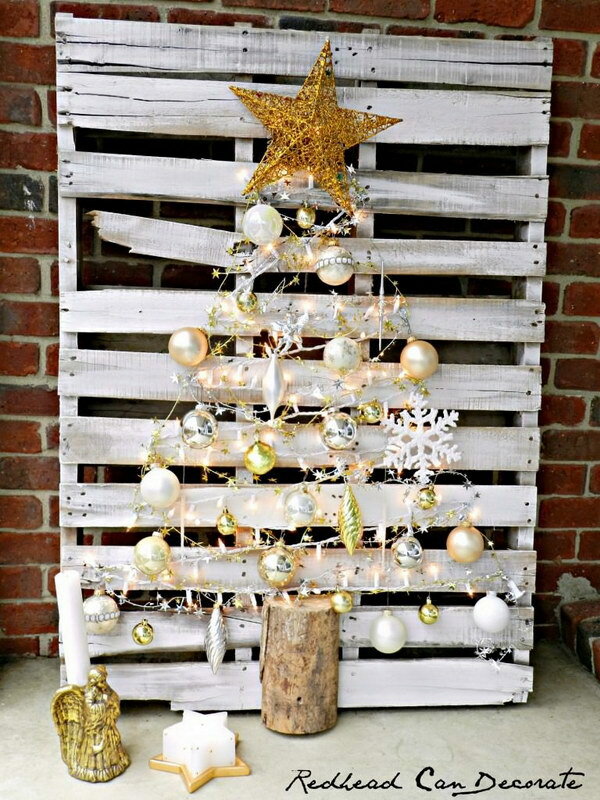 Achieve a great rustic look with this twig Christmas tree. Add lights to really make them light up a room. Get the tutorial via blog.free people. 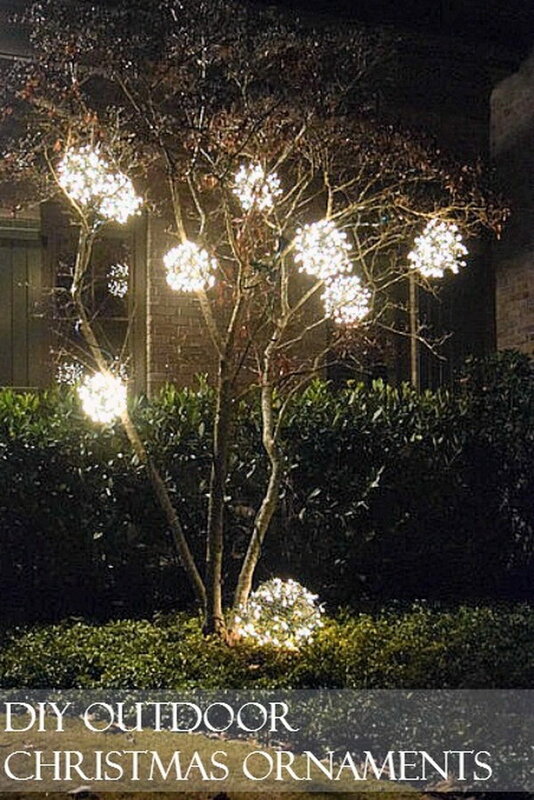 What you need for this stunning light balls are some chicken wire and those leftover lights. 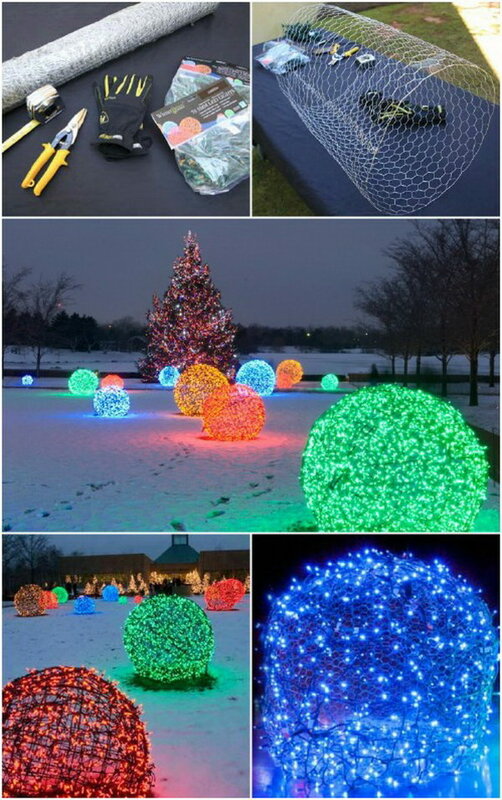 Look so great in your front yard and your yard will be filled with Christmas cheer with these beautiful and colorful light ball ornaments. Tutorials via blog.christmas light setc. Globe Light Winter Luminaries. 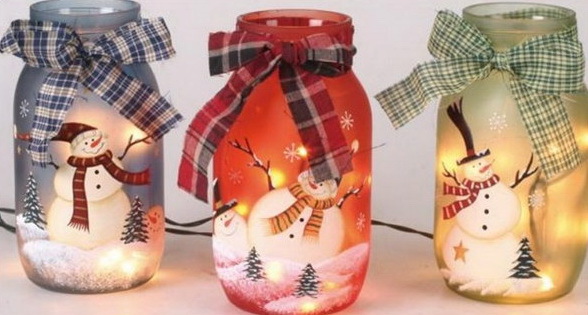 Super easy and super fun Christmas decoration ideas. source. 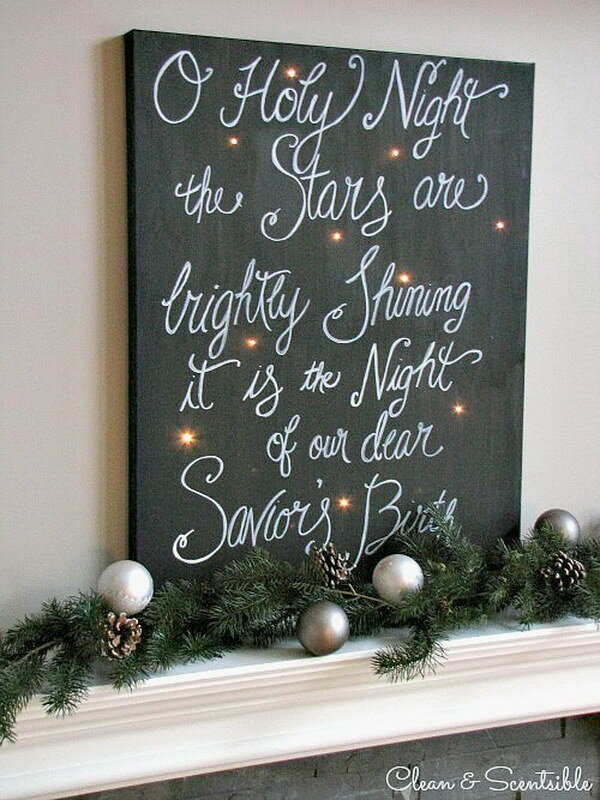 Create this lighted christmas sign and display it on your Christmas mantle. 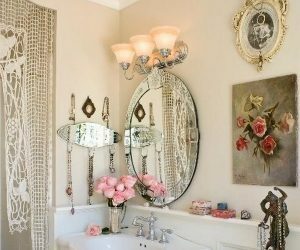 Love the elegant look very much! See how to make it via The Idea Room. This stunning christmas ball luminary was made with all those old, previously loved Christmas balls and some old string of Christmas lights. Super easy to create and will brighten up any holiday table or mantel. See the details via Mango Juiced. 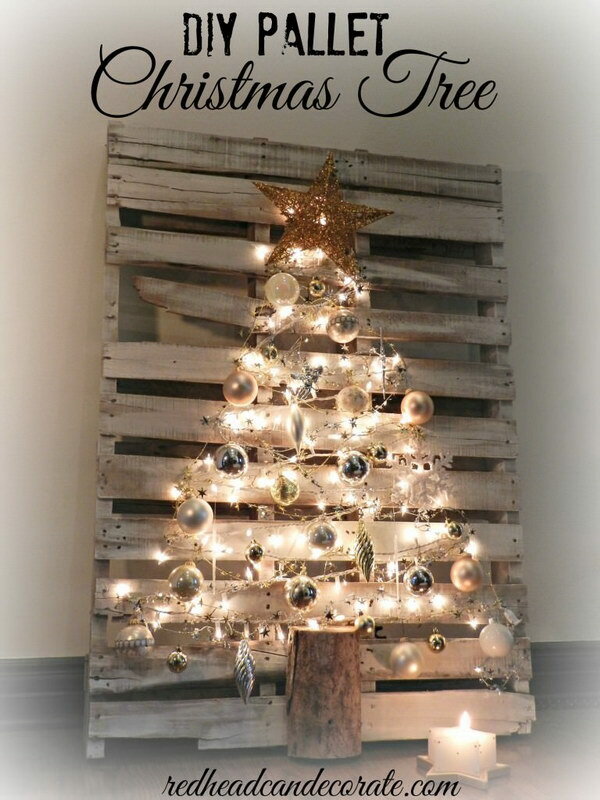 Use those old pallets together with decorations such as bulbs and ribbons to create this adorable lighted Christmas tree for decorating the porch or yard this Christmas. 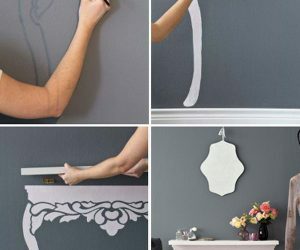 DIY instructions via red head can decorate. You will need shadow boxes, a few trees, some fake snow and the lights for this project. 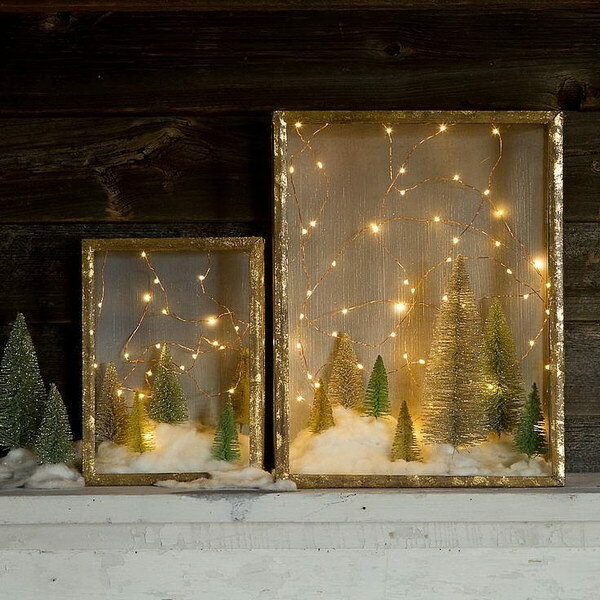 Decorate with this enchanted forest shadow box for a Christmas look. 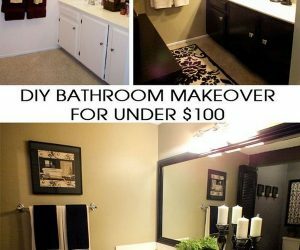 Get the tutorial and more details via popsugar. 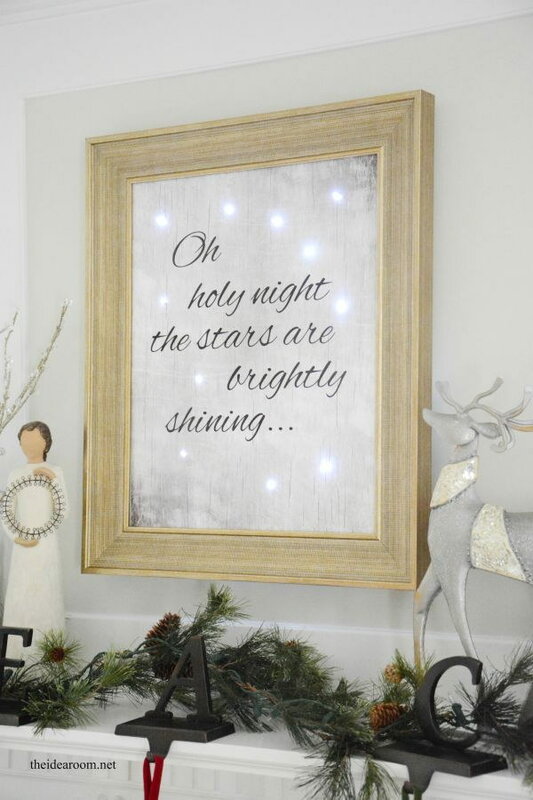 Give your Christmas mantel a great Holiday look with this twinkling christmas canvas art. Check out for the detailed instructions via Clean and Scentsible. 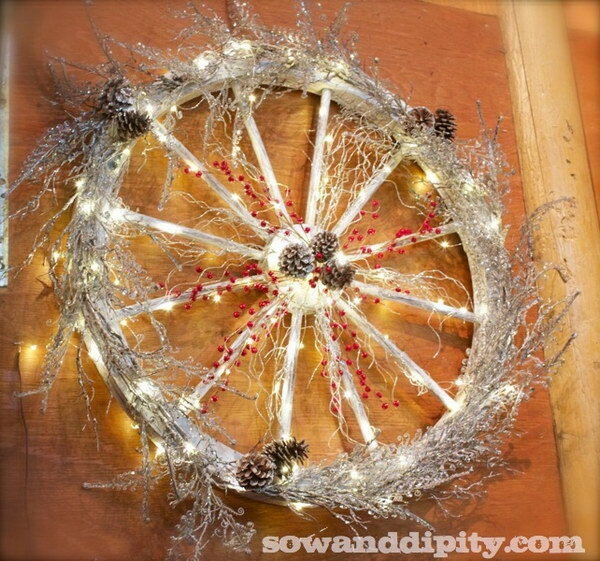 Decorate the old wagon wheel with some pine cones, berries, and Christmas lights for a rustic look this Christmas season. Credit Sow and Dipity. 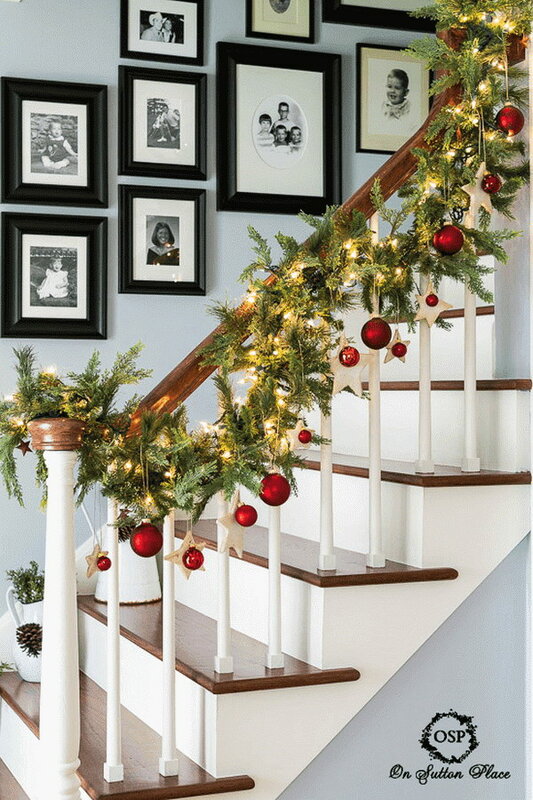 Decorate the stairway banister with fairy lights, stars red balls and some artificial greenery and give your home a holiday cheer. Check out for more directions via onsuttonplace. 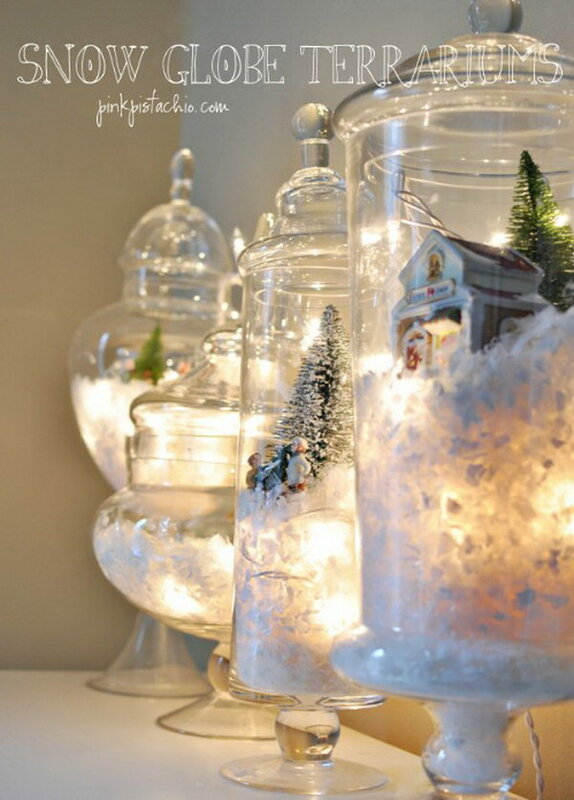 Create your own winter wonderland for all the snow and wintry excitement by adding your string of lights inside large jars. 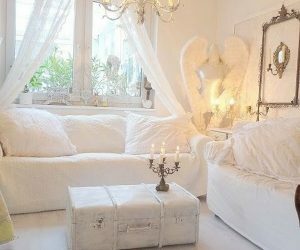 Get the details via pinkpistachio. 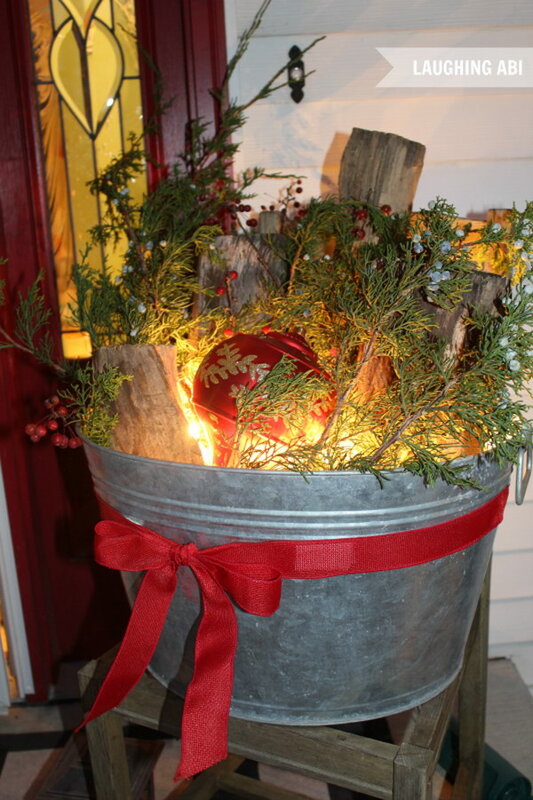 Go out into the yard and gather wood, twigs, evergreens and other seasonal items, and just pile them all in a bucket and add your lights. 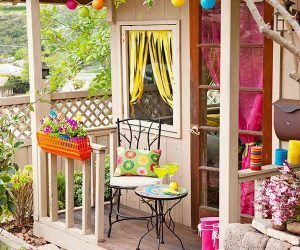 Amazing decoration ideas for your porch! Get the instructions via laughingabi. Pretty sparkling fairy lights give this rustic porch basket just the right warm and friendly look. 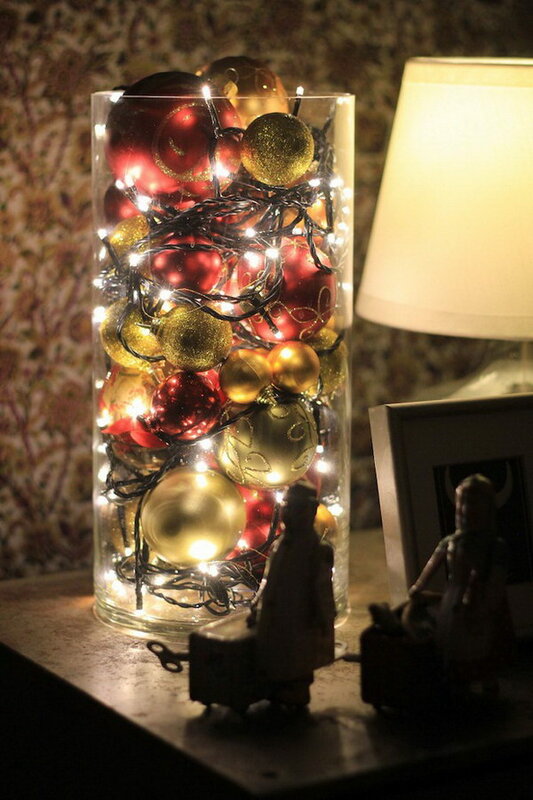 Super-easy, super-quick idea for Christmas decoration! See the tutorial via Cassie Fairy. 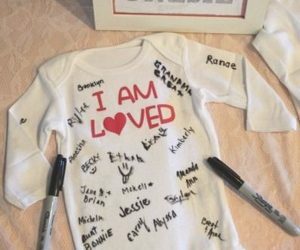 Whimsical and fun Christmas projects! Add the perfect touch when lighted up with clear Christmas lights. source. 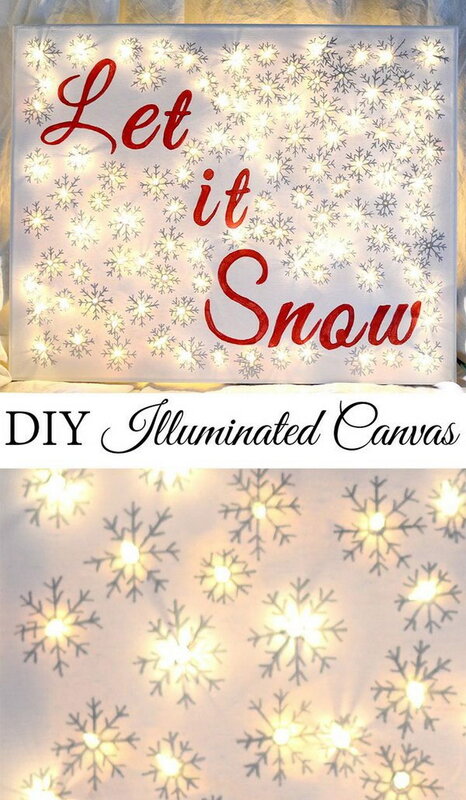 Using sharpies and mini lights to create this cool and stunning lighted Christmas canvas. More details via bubbly nature creations. Create this cool flame fire pit with leftover string lights and add warmth to your home during this Christmas season. See the tutorial via blog.free people. Made from chicken wire and a strand of lights! See the tutorial via Miss Information Blog. DIY Tomato Cage Christmas Tree Lights. Make great outdoor decor this Christmas! Tutorial via 17 apart. See the details via The Kim Six Fix. Hello, I see that you have used my wagon wheel wreath in your line up. Although I appreciate your including me, I was not contacted for permission of use and you don’t credit the photo properly. It just says source. Please fix this to include the name of the website: Sow and Dipity. or kindly remove the photo. Thank you. Hi, Shelley. We are glad to inform you that the problem with your email has been fixed. Thank you for letting us know.